It's been a nice weekend so far at FurCentral. It has been some time since we have hosted a fur on a cross-country road trip, but this weekend we hosted electropaw as he made his way from Illinois to Arizona. He arrived late Friday evening so there wasn't a lot of time to socialize. On Saturday we took him down to Old Town so that he could play tourista. I took him on walkies with Mesa and me later in the afternoon and he introduced me to geocaching. On a whim he checked a geocahing website and found that we were within 100' of one. I found it! It was funny to think how many times I had walked right past it. We both laughed when he Twitted that we found it and instantly got a reply from wildfox34. Talk about a geocaching junkie! We tried to find another one nearby but couldn't locate it. I'll leave you with this pic taken a few days ago. 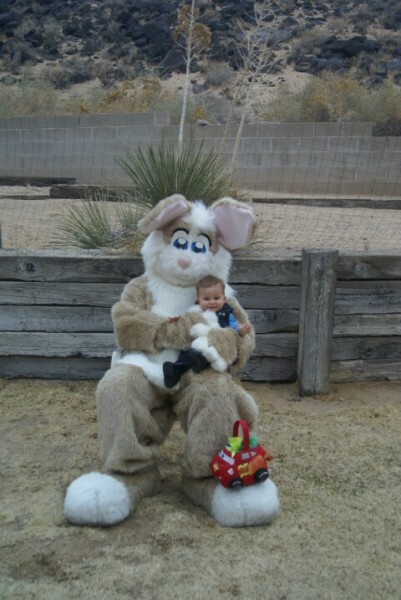 Some friends wanted a pic with their son and the Easter Bunny. They didn't like the mall bunny, so I did a stand-in for EB.